The aim of this page is to answer any questions students and parents may have about our return to our original building on Silchester Road in September 2018 and any safety or student well-being issues related to Grenfell Tower. Governors voted to leave our temporary facility and start the 2018-2019 academic year back in our purpose built, Silchester Road building. This was following a period of consultation in the 2018 summer term. The letter from our Chair of Governors to parents & guardians explaining this can be found here. The decision was strongly supported by the parent body and students as polling across parents, carers and guardians came back with over 90% favouring a return to Silchester Road. Additionally, there was a weight of evidence that is sufficient for us to conclude that it is safe to return with Grenfell Tower stable in its current condition. Our priority in all of the discussions about moving back was what is in the best interest of students, both in terms of their education and their personal well-being. If we did not feel that it was safe to return, or that overall it will be hugely beneficial for them to back in their real school, the decision would not have been made. 1) In its current state the tower is safe, stable, and poses no risk to local residents or anyone attending the Academy site. There is also no evidence the air quality is affected by the tower. Governors have confidence over the safety because of the extensive evidence they have reviewed and the monitoring regime the school has in place. Details of both are below. 2) No decision has been taken over deconstruction of Grenfell Tower and it could well be many years before this work even commences. If/when the tower is brought down, of course more work will have to be done to guarantee KAA students’ education is not disrupted by noise/dust and more consultation with parents will be needed. As you can see from the letters below, we have written guarantees from all relevant authorities that the school, along with local residents, will have a voice in how any deconstruction process would be carried out. We also have a contingency plan which is that, if we feel it is in students’ best interests to move out during deconstruction, we can return to the temporary school which remains standing. We are confident this will not be necessary but have retained this option in response to parents’ concerns. 3) Whilst we accept proximity to the tower can be emotional for some students we are confident that we have the resources in place to support all students to make this return home successful. The fact that more than 90% actively said they wanted to move back was a clear mandate, and before the school’s return we worked closely with any concerned students to complete extra reorientation visits (including participation in the summer academy) to get these students comfortable with the idea of returning too. We also believe that continuing to keep students in temporary accommodation, when they so clearly want to return to their “home”, would have actively harmed their education and personal wellbeing in coming years. Evidence of the return to KAA is that students have overwhelmingly settled well and are benefiting hugely from being back in their real school building. The process of KAA returning home is similar to that of local residents and businesses getting back – a step forward and something that is allowing students and staff to look to the future. a) Commitment from SoS Education and SoS Communities that KAA will be a “key partner” in any future potential deconstruction and also we can move back to the temporary site if that is what we decide. The letter can be found here. b) Reassurances on the stability of Grenfell Tower and commitment to allow KAA to monitor. A letter from Doug Paterson Chief Executive of London Borough of Bromley and the Independent Site Management Lead, Grenfell, can be found here. The Governors are appointed our own structural engineer to ensure that going forward, we have a clear understanding of what is being planned and technical data can be analysed not just by the Grenfell Site Team but also our own independent expert. c) Alongside the NHS, a Mental Health and Well-Being Risk Assessment was conducted, with mitigation measures put in place, on the both the potential risks of the academy returning to KAA1 or staying in KAA2 in the academic year 2018/2019. This can be found here. d) A full and independent report showing our own building is safe. This was conducted by FDS and can be found here. e) Details of both the ongoing Public Health England and our own independent air monitoring regime. Governors appointed MLM Group to conduct our own independent air monitoring, the results of which are below. This is in addition to the monitoring that Public Health England have been undertaking in the area around the tower for the last year. They publish weekly environmental monitoring reports which you can read here: https://www.gov.uk/government/publications/environmental-monitoring-following-the-grenfell-tower-fire. Like all schools locally, we reviewed our fire strategy and evacuation plans in the light of the Grenfell tragedy. In addition to our regular fire consultants, both the council and central government have commissioned separate, independent assessments of our building, all of which have confirmed its safety. The top area of concern from parents has been around cladding, and parents can read an independent analysis of the school’s cladding here: FDS Fire Safety Review. The key point is that our cladding is different and safer to that used on Grenfell Tower, and that it has been properly installed with fire breaks behind it and this work has been checked. We will also upload our full fire evacuation strategy, including floor plans and exit routes, onto this page before any return. A school’s Fire Risk Assessment is continually and regularly reviewed and also must be reviewed whenever there are changes to the building. An independent company called SFE Ltd was appointed by the Department for Education (DfE) on behalf of KAA to undertake the Fire Risk Assessment (SFE is an accredited member of the Institute of Fire Safety Managers (IFSM)). The London Fire Brigade (LFB) have the responsibility for enforcement of the Fire Risk Assessment and suggested some small improvements to the building, in part to reflect our increased student numbers in the 2018-19 academic year. These were all completed prior to the school’s return to the site. More information can be found here about the work the DfE and LFB have done: Methodology of the fire risk assessment for Kensington Aldridge Academy. The vast majority of students were excited and eager to get back and did not express concerns or reservations. Many of course were already used to being in the immediate area around school, as it is where they live. However, for some students, we did expect the process of going back to be emotional. The important message here is that every student will had a unique set of emotions around this, any reaction is valid, and all students were provided with tailored and appropriate support by the school. As part of our pastoral support at KAA, we offer a range of counselling, therapeutic and psychological support to students and parents. These services are important in any school, but are especially so at KAA following the tragedy at Grenfell Tower on 14 June 2017. KAA works closely with the NHS Child and Adolescent Mental Health Services (CAHMS) to develop a range of provision which meets different levels of need as required. We also have our own Clinical Psychologist, Dr. Susanna Rota, who works with our Assistant Principal for Inclusion, Niall Dumigan, to oversee and coordinate this work. Students are offered these services based on referrals by parents, academy staff or care workers, or by self-referral from students themselves. If you think your child would benefit from the services available please contact Mr Dumigan on n.dumigan@kaa.org.uk or 0207 313 5800. For detailed information on KAA’s counselling and therapy provision visit our counselling page. From June 2018 onwards we carried out an optional programme of re-orientation visits to help develop students thinking about returning to our building. Going back into school after such a long time away could be an emotional experience, and careful support was provided throughout these visits. Sixth form students completed re-orientation visits earlier in the term and sat their summer 2018 AS and A2 exams in KAA1. The decision to hold the sixth form exams at KAA1 was a direct response to student and parent requests. 1) Visits during the school day: Students visited the building form by form accompanied by their form tutor and senior staff, with members of the school therapy team on hand in case any student became upset. 2) Visits before school: These were open to all students with the option for parents to attend with them. 3) Targeted visits for selected students: For obvious reasons, students who we know to have been particularly badly affected by the fire were taken individually or in small groups, with additional therapy. · Opening up some of our internal spaces and the Art Terrace overlooking Silchester Road at break and lunch. · Lunchtime “enrichments” and supervised activities in the sports hall each lunch break. · Not doing “line-ups” in the playground near the tower anymore. These changes mean that any student who doesn’t want to be near the tower during the school day has the option not to be. We are aware of media coverage around Professor Anna Stec’s research regarding Grenfell Tower and the surrounding area. Any story like this could understandably cause concern for people. Governors take the issue extremely seriously and work closely with PHE, central government and conduct our own independent testing too. We will continue to follow this closely as anything that can help us better understand possible impacts of Grenfell is a good thing. Whilst concerning, at no point has it been suggested by Professor Stec that local residents, business or schools should take any immediate action, only that further analysis and public health screening is required. An important point to note on this issue is the level of cleaning and the replacement work that took place prior to moving back into KAA. We commissioned Belfor (a leading UK company whose core focus is recovering homes and businesses following fire and water damage) to thoroughly clean our systems and buildings. All of our air handling and ventilation systems were cleaned in their entirety and all the air filters replaced. We ensured that all the furniture within the school, as well as every vertical and horizontal surface, were professionally cleaned to ensure there were no contaminants. The entire playground and all outdoor areas were replaced as was the MUGA pitch. We also have our own independent air monitoring being conducted by MLM Group and the results have not shown any need for concern and we have undertaken soil analysis on the KAA site. We do not have a lot of soil on site and prior to moving back into KAA1, we had replaced the top soil in all the planters and as well as replacing the playground surface. MLM Group (https://www.mlmgroup.com/) have undertaken testing on our behalf. Below is a link to their findings. On the 15th March, Nick Hurd, Minister for Grenfell Victims wrote the following letter to local community groups and business regarding environmental testing on and around the Grenfell site. We are also aware of concerns about asbestos around Grenfell Tower. 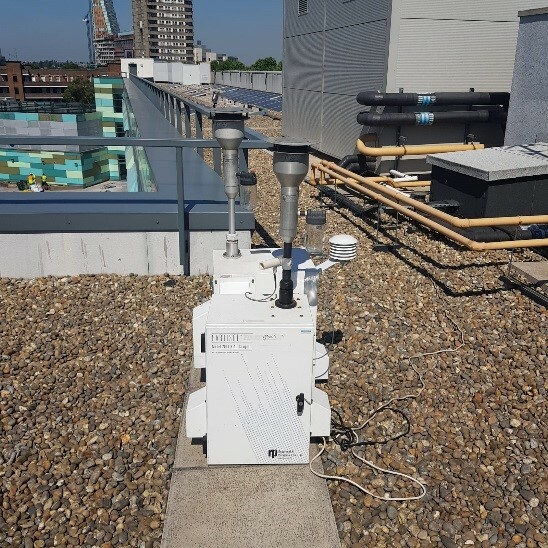 Air monitoring systems have been installed on the roof of our academy building in June 2017. These were installed by Public Health England days after the fire. These systems identify fine dust particles and throughout the monitoring nothing has been identified which is outside of World Health Organisation guidelines or out of sync with results seen across the rest of London. We continue to undertake our own air quality monitoring around KAA and we have been doing so since August 2018. MLM Group (https://www.mlmgroup.com/) have undertaken this monitoring on our behalf. To date, MLM have found nothing that would cause any concern. Below is a link to a report that summarises their findings and results until 28 February 2019. A copy of the full report is available on request by emailing info@kaa.org.uk. – On the night of the fire the academy acted swiftly and ensured that all ventilation systems were shut down as a precaution. This was completed within an hour of the fire starting. – As a precaution, following the fire we contracted Belfor (www.belfor.com – a leading UK company whose core focus is recovering homes and businesses following fire and water damage) to thoroughly clean our systems and buildings. Our air handling and ventilation systems were cleaned in their entirety and all the air filters replaced. We ensured that all the furniture within the school, as well as every vertical and horizontal surface, were professionally cleaned to ensure there were no contaminants. This was carried out in early August 2017, prior to the furniture being moved to KAA2. – Specific asbestos monitoring is in place around Grenfell Tower. This monitoring is conducted on all sides of the tower by Public Health England, with monitors moved twice a week to measure in different locations. At no point has asbestos been detected by these monitors. – As a precaution, monitoring continues to take place both now and will do so throughout any deconstruction of the tower. If the tower is deconstructed, specialist contractors will be bought in to handle any asbestos, as is currently the case when materials have been removed over the previous months. They must follow strict specifications set out for removing it and a detailed plan is made for each individual site, taking into account individualities of that building. – Governors appointed MLM Group as a precaution to conduct our own independent air monitoring. To date, MLM have found nothing that would cause any concern. “The NHS organised respiratory clinics in the local area following anecdotal reports of a Grenfell cough, however people who attended these clinics had pre-existing health conditions. Local GPs have not reported an increase in people coming forward with breathing problems as a result of the fire. – The tower has been significantly strengthened by propping in areas which have been damaged and scaffolding, which runs through the centre of the building as well as around the outside of it. – There is a building monitoring system which can detect any movement, even less than 1mm, in constant use. It is able to send auto alerts to the Site Management team (and therefore the school) if any movement is detected. – More than 3500 props inside the building provide support to areas of the building which have been damaged and are checked twice weekly to detect the sign of any changes. – The Health and Safety Executive (HSE) make weekly inspections of the building and will continue to do so. – Structural engineers have advised that they are not seeing anything they would not expect or anything that is unusual. – The site management team are in constant contact with the school and will quickly share any information should the need arise. Although decisions have not yet been made about deconstruction, the site team have ensured us that would be done with as minimal disruption as possible. Likely methodologies which could be used to deconstruct the Tower (e.g. a progressive deconstruction from the top down) have been used many times before, on similar size buildings in built-up residential and commercial areas, and without incident. Any deconstruction of Grenfell will have national attention and be under close scrutiny. As such, we are reassured that it will be completed even more sensitively and carefully than these earlier demolitions. We have been advised that the damage the building suffered during the fire does not mean that it is at risk of collapse or that it cannot be demolished in the preferred way. If the tower is indeed deconstructed, and in the very unlikely event that something unanticipated came up during the deconstruction process, work would stop immediately in order for school and the wider community to take further advice and decide how to proceed. In this scenario, we would of course talk to parents in a transparent way about our options. However, based on all the objective evidence we have been given, we think it is reasonable to assume this is not going to happen. Will there be noise and dust caused by the deconstruction of the tower? No decision has been made regarding the future of Grenfell Tower. However, the Grenfell Site team have said that, as you would expect, any deconstruction will generate noise and dust. However, they do not think, based on evidence from other similar projects, that the levels of noise or dust will prohibit the school running smoothly or cause any health concerns. The Site Management Team has committed to working with the school and local residents to ensure things are handled carefully and sensitively. – No noisy work will be carried out during GCSE and A Level exams. – No heavy vehicle movements will be carried out at the beginning and end of the school day when students are coming in and out of KAA1. Whilst this is a very unique situation we are in, it is not uncommon for schools or other institutions generally which are based in busy cities to operate next to building sites. Dust suppression methods will be employed and we have been advised that there are no health risks, including for students who have asthma. Some parents may have heard rumours of a “Grenfell Cough” – a breathing condition purportedly caused by living close to the tower in its current state. We would like to emphasise that Public Health England have been monitoring the air quality in our playground and around Grenfell for months now and have found no evidence at all that this condition or any breathing difficulties are being caused. Overall then, we are confident that, by working in conjunction with the Site Management and public health teams, any possible risks associated with the potential deconstruction can be managed.